The road to achievement is not smoothly paved and lined flowers, (like most roads in Indonesia) it is dusty, rocky, and full of potholes, but the destination is more fulfilling for those obstacles. The marathon field trip was no different. Shane had diligently trained 3 girls and 7 boys from his local school for 8 months in preparation for this trip, fund raised the whole thing and procured a donation of running shoes for all the students. Literally turning their lives upside down. Dedication to a sport is something that most kids from Tosari never have the opportunity to experience. They have to take care of younger siblings, help with their house and farm. It all led up to 7 p.m. on Thursday night. 10 students and 6 chaperons all gathered in the front room of Shane’s house waiting for 2 vans to arrive that would serve as a vomit mobile for the carsick students leaving their village for the first time on mountain roads. The vans would take us to the train station where we would board a 5 hour train. After a long car ride out of the mountains, we were all aboard the Bali Express. The train attendants brought complimentary blankets and pillows to us. The kids looked at their packets for a good long while, probably looking for a price tag, before noticing Shane and I were already tucked into our complimentary mobile beds and copying our example. After the train ride we caught a bus that took us to a ferry. The students gazed out as the sun rose over East Java and the ocean and I wondered how they were feeling. I was too young to remember the first time I saw the ocean, but I’m sure they will. With the reflection of water in their eyes, they stood at the railing for the whole hour. We disembarked the ferry on the same bus we had taken onto it to sit in Bali traffic for another 7 hours, arriving at our hotel at 2 p.m. Friday afternoon. Tired from so much travel, we went to nap and let the kids indulge in their first ever swimming pool session. We fell asleep to the sound of laughter and splashing while the other chaperons lounged in the cabanas watching over the ecstatic children. 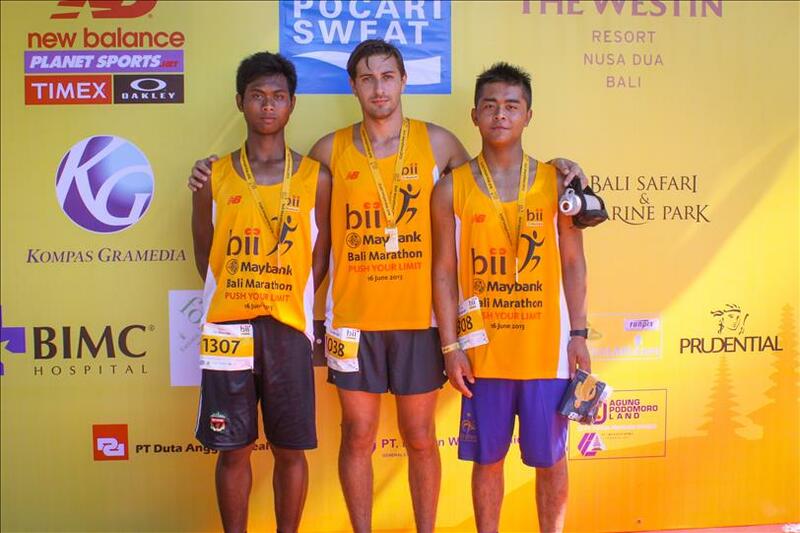 The next day we were promoting the Bromo Marathon, which Shane created as a charity event to bring money to renovate and supply the disadvantaged libraries in the Tengger region. Because of the remote location, not many government resources actually reach the East Java mountain villages. 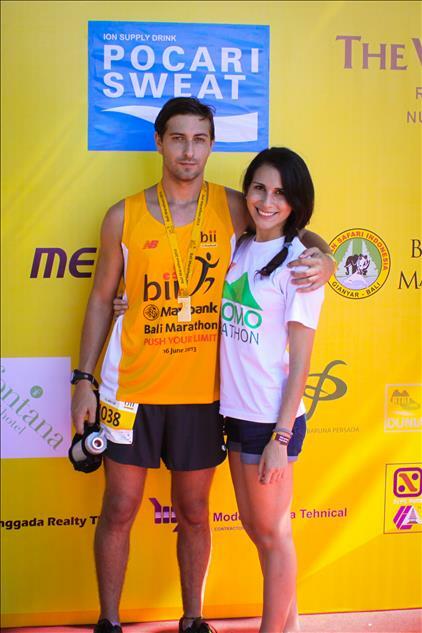 We had a table at the Bii Bali Marathon Race Expo to pass out flyers and answer questions. Many athletes were already registered and stoked for the mountain run. We were already on the radar for athletes. At the end of our shift, we picked up the kids race packets and left the expo with 11 bright yellow bags in tow feeling like Santa Claus bringing gifts for village children who’ve never experienced a Christmas in their lives. Giving the packets to the kids was ceremonial. We went up to their rooms to find them wide eyes with ear to ear smiles sharing their recent souvenir purchases with one another. The girls were wearing adorable floral rompers and the boys were rocking tanks, sunglasses, and shorts. It was a huge change from always seeing them in school uniforms or rural running attire. They had assimilated to Bali wonderfully and it warmed my heart a little to see them breaking out of their shells and getting excited about expressing their individuality in clothing. We complimented their style and called them to a meeting at the pool. I could see the excitement in their eyes as Shane called their names and they came one by one to get their packet of goodies. I attached their Runner event pass bands to their wrists. At that moment it seemed that everything became real to them and the moment they had been training for so diligently was suddenly tangible. They dove into their yellow bags and took out their bright blue Pocari Sweat water bottles from their bags and asked if they were theirs to keep. “Yours until you die” was Shane’s reply just as the memory of this weekend would also be for them to keep forever. The day of the race the runners woke up at 2 a.m. to get their 3 a.m. bus to the Bali Marine and Safari Park where the race would begin at 5. The other chaperons and I slept and took our 6 o’clock bus there. There were 7 students running the half marathon and 4 running the full marathon and I stood by in waiting at the finish line excitedly zooming my camera lens in on anyone short or young looking to check if it was one of our own. After about 30 minutes our first finisher came into view. Dwi one of the girl runners was the first to finish in a little over an hour and a half. She was followed by Lilis and a cheer for girl power caught in my throat. Next came a couple of the boys and another of the girls and before I knew it all of our half marathon-ers were finished, drenched in sweat and achievement with medals around their necks. They hung out on white plastic event chairs sporting exhausted smiles and recovering with bottles of Pocari Sweat which if you’ve never had it is pale in color: looking and actually tasting a little like sweat, but full of isotonic goodness. 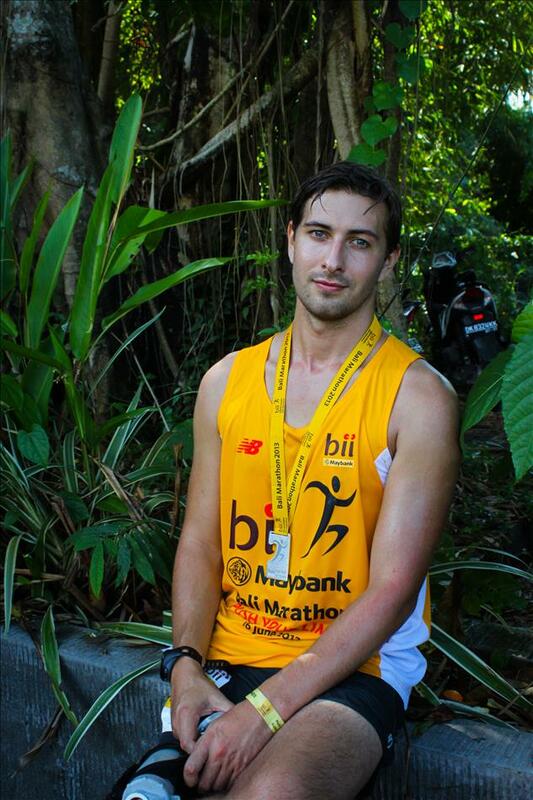 Within a few hours the tropical sun made its appearance and so did the marathon runners. Beads of sweat made their way down my spine as I stood at the finish line among so many proud supporters waiting for loved ones to cross, congratulating with high-fives, salty hugs, and huge smiles. It wasn’t too long until I spotted Shane and his students. He and Yoman sprinted towards the finish line pushing each other with silent encouragement as they approached the goal that they had imagined for so long. The letters F-I-N-I-S-H materialized a little clearer in front of them and closer with each step. My eyes burned with moisture and I enclosed Shane in a damp hug as soon as he got across. I blink long and hard and managed to avoid the awkwardness that comes with crying in public. I always get teary with emotion and inspiration whenever Shane finishes a race. I actually have little to do with him running or preparing for the physical feat that he surmounts as he grosses the checkered lines but I feel proud all the same. Next comes picture time and I get to capture the definition of exhaustion on film, but somehow everyone manages to still be strikingly photogenic. At the finishers area a couple of elephants are out doing their elephant things: swinging their trunks around and adding to the festive mood among hundreds of limping zombie bodies aching for an ice bath and some sleep. The atmosphere is full of the contentedness of satisfied goals. It’s impossible not to feel peaceful and happy among the jungle, the elephants and the Hindu shrines adding a light note of incense on the breeze. It’s not so often that one gets to participate in something that will likely change the life of others. The students broke out of the box of their hometown, trained hard through terrential rainfall, obligations to their farms, achieved their goals in shoes donated from the other side of the world, and greatly broadened their horizons just by visiting the next island to the East. 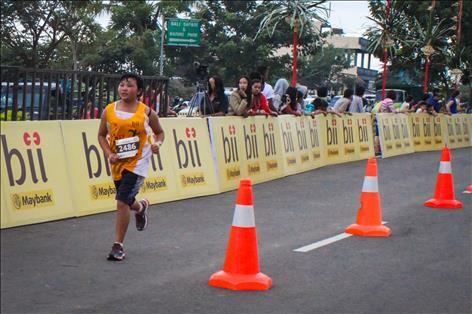 What happened for the kids goes so far beyond the race: the invaluable experiences of seeing the world outside of the Tengger, feeling the reward of working towards something; those feelings are addicting and shaping. To have been able to be a part of something that is so big for these students has been life-changing for myself. Watching kids see the ocean for the first time, play in a swimming pool for the first time, and cross a finish line for the first time and how it felt to be part of that will be with me forever. So many of us have the power to make things happen for people, it’s just a matter of putting forth the effort. I want to change lives for my whole life. Thank you to all who supported the Tosari Cross Country team through donations. This couldn’t have happened with out you. I hope I’ve been able to share a little about what it has meant to these kids and their futures. Kudos to Shane’s hard work and long term plan coming to fruition, and the team making such a strong showing. Does the team live on and grow from here? The story was light on the animated insights like the “barf mobile” and read more like a romance. Ahhhh! Great job. It’s your willingness to express your thoughts and feelings which makes the stories so much fun. Keep um coming! Well??? Your readers are hungry for more and waiting. How are you and how’s life in Indonesia? Things are okay over here, actually just going on holiday to Australia for 2 weeks, I’ll write about that soon. Indonesia is alright, nothing special, just the same as usual I guess. Just trying to keep a positive mindset, so I haven’t written in a while. Sorry about that. I’ll write more soon.